It's incredible for me how many guitar players do not know the notes on their fretboard. This is something that does not happen for any other instrument: it's in fact the very first thing that is taught for any instrument but the guitar. Now I don't think that STARTING from the notes is a great introduction to the guitar, but unless you are a complete beginner then you need to know your fretboard the right way. If you are like most players, learning the notes seems like an Herculean task. Hey you have to learn ALL the notes. Over ALL the strings, and ALL the frets. It seems downright impossible. And even if you manage to learn all of them by sheer memorization, you are probably going to forget them, right? Surprise surprise, it is actually quite easy to learn the notes permanently if you know a good way to train this knowledge. 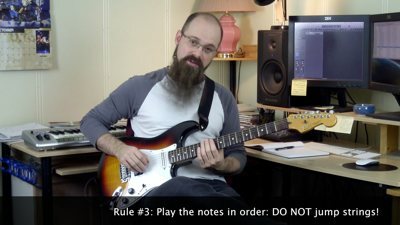 Watch this video on how to learn the notes on the guitar fretboard so that you will never have to "guess" where notes are anymore.